I have the most annoying rattle but it's not the trapdoor. it's coming from the panel right beside the trapdoor on the passenger side. I can't even figure out how to remove the panel much less fix the rattle. What is a trapdoor on a Mustang?? I've never heard that expression before. 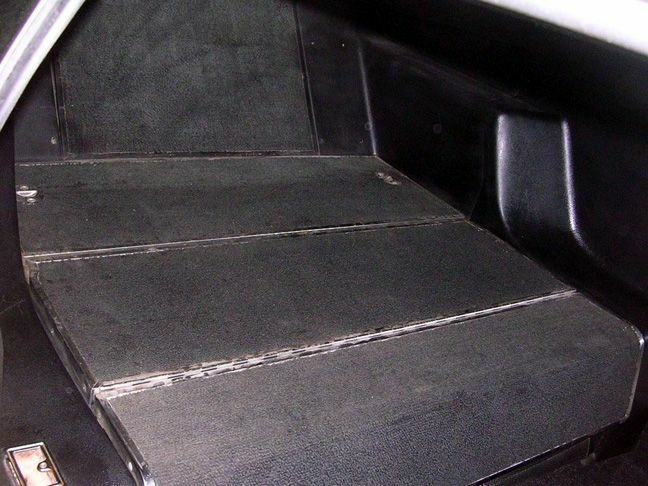 Could the trapdoor be the lid of the glove box? Maybe? I dunno. I had a similar problem on mine. A very annoying sharp rattle on the passenger side. With mine it was a little area of the inner door panel rubbing against the dashboard. (That vertical panel that is "at the end" of the dashboard). I rubbed some household soap on it and it was gone. It could also be the dash pad that came a little loose and is now moving. Such things are always hard to figure out, especially from a distance. Best is to proceed by trial and error. Have a passenger hold the door slightly open when you drive. If the rattling stops, it's the door rubbing somewhere, if it doesn't stop.... well, at least you know what is NOT causing the problem. Remove the dash pad and drive, and so on. That's how I found the problem. is it the fold down door? and snap some pics of the panel you want to remove. Maybe I'm calling it the wrong thing, but we always called it the trap door. It's the door on a fastback that opens into the trunk and serves no real purpose that I know of except that it allows you to put your skis onside the car. As for the panel, I can't take a picture because the car is not here this week. But on each side of the door which opens into the trunk their is a trim panel. You know the ones some kid ruined by cutting a whole into them the 80's for a speakers. is there any chance it could be a loose/broken shock on that side? Good guess, I've had that problem before, but no. It really sounds like the trapdoor is rattling, but it's not. It's the panel next to the trapdoor. Just forget, what I posted above...... except maybe for the narrow it down part, that is. is the panel built into the plastic armrest/quarter covers? Mine is not a fold down rear seat. Can you get someone to ride back there and press/hold against it till it stops and then look from the trunk side for screws/bolts.